Hello, Annette Green here today with my pick for the e-Team Picks Challenge this month which is "Monochromatic." Anything goes, it just has to be monochromatic, which means your creation should consist of one color and shades of that color. With so many colorful papers out there, I don't usually create in this manner, so this was a great challenge for me, and I hope you'll give it a try too. Details on participating in the challenge are listed below, so be sure to scroll through and check them out. You could win some extra spending cash in the eP store from our prize drawing! 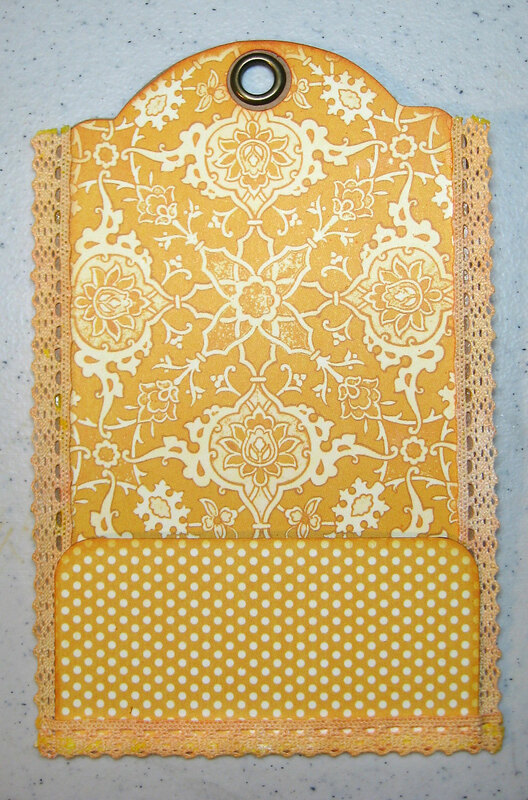 My choice of color for this challenge was the golden yellow found in the new, gorgeous paper from Graphic 45's Bohemian Bazaar collection. 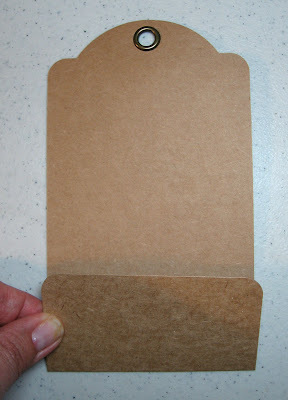 I created a gift tag with a pocket for a gift card. 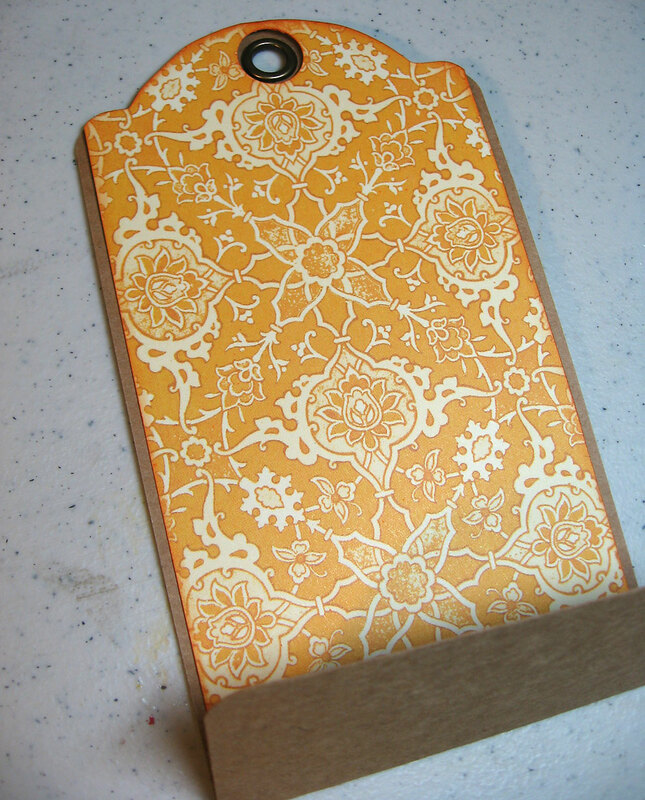 I started with a Graphic 45 tag from the Large Tag Album and scored it at 2 inches from the bottom, folding up the flap to serve as a pocket. 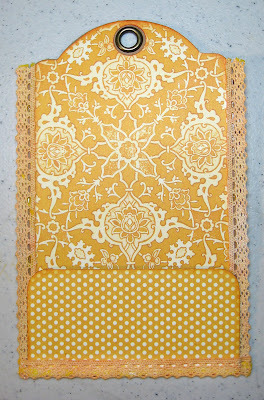 Bohemian Bazaar paper adhered to the background, after inking the edges with Wild Honey Distress Ink. I colored pieces of white lace trim with Dylusions sprays, first with Lemon Zest, then lightly with Pure Sunshine. 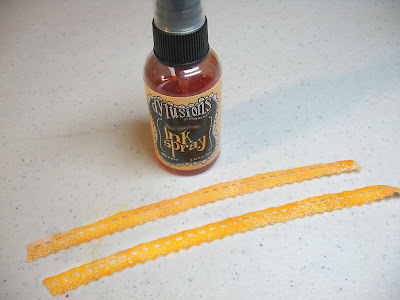 After heating the lace to dry it, the color faded softly and matched my tag nicely. I added the polka dot paper (Kaleidoscope) also from Bohemian Bazaar to the pocket flap, then adhered the lace trims and sealed the pocket on the sides. 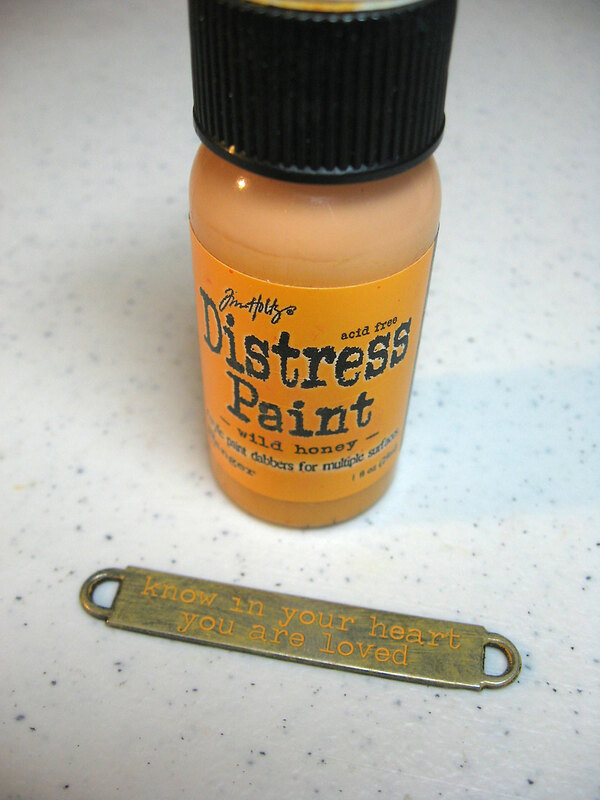 Wild Honey Distress Paint matched my color scheme nicely, so I dabbed some of it onto a Word Band making sure to get paint down in the recessed words. Then I swiped the paint off the raised surface with a clean towel and heat set it to speed up drying. After attaching some pretty yellow ribbon to each end, I attached the Word Band to my pocket front. I did the same treatment to the two keys using Wild Honey Distress Paint and layered them at the top of my tag. 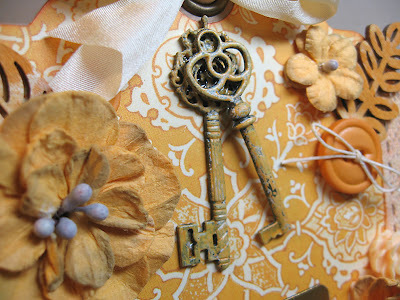 Buttons, Petaloo flowers, and Prima wood shapes serve as wonderful embellishments. This fun pocket tag would be a great addition to a bottle of wine, or attached to a special gift. 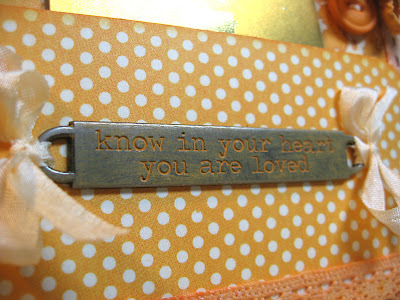 And you can fill the pocket with anything you like, perhaps a smaller tag with a lovely sentiment stamped on it or a hand-written note, or a fancy chocolate in a gold wrapper, or a gift card like I did. The eTeam Picks Challenge is held on the third Thursday of each month and each challenge is an opportunity for you to be inspired by one of our eTeam’s creations, to share your work, and to be entered into our challenge prize drawing! The eTeam Picks Challenge is all about inspiration and having fun! During each challenge one of the eTeam members will share a topic, word, technique, sketch, or product that will become the foundation for your creation. This challenge is all about mixing it up and just enjoying the creative process of feel free to share a journal page, card, scrapbook project, mini album…. Anything goes! We want to see your work and hear about your inspiration. All of those who play along with our challenge will be entered into a prize drawing for a $15.00 gift certificate to the eclectic Paperie store. • You do not have to use products sold in the eP store…but we do love it when you do! • Share a direct link to your creation, not just your blog, using the Linky Tools feature at the end of this post. If, for any reason, the Linky Tools doesn’t cooperate, please add a link in the Comments section of the blog. • When uploading to any online galleries, please use any of the following keywords; eP, eclectic Paperie or eTeam Pick Challenge. Link your creations to the eP blog. • If you’d like to be considered as one of our featured projects and be entered into our prize drawing, please be sure to add your link no later than 6pm EST on Thursday, June 27th. We’ll announce the winner/featured project right before the last Thursday’s post. Beautiful, Annette! 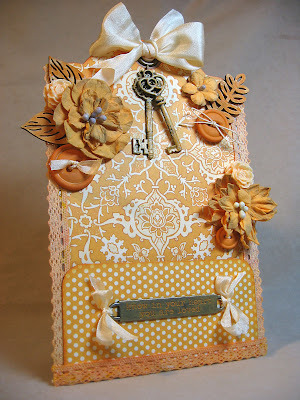 I love this honey color and all your sweet little embellishments are so perfect together!! Love, love, love this, Annette! The colors are so pretty and I adore the flowers mixed with the metal accents...just perfect! Great challenge and your project is dreamy in the honey colors. oh how pretty, Annette. Those papers are luscious and I love the metal tag - perfect addition to a beautiful project. Beautiful design. Lovely card! Thanks for visiting and leaving the sweet luv. Great job ! Love your tag and how you "worked" the colors. That print from G45 is awesome! Man that color and patterned papers are gorgeous together!! Your design really shows off the beauty of G45!!! Oh this is gorgeous, Annette - you did a beautiful job!! It's not easy to make a monochromatic project and you did it so well!! 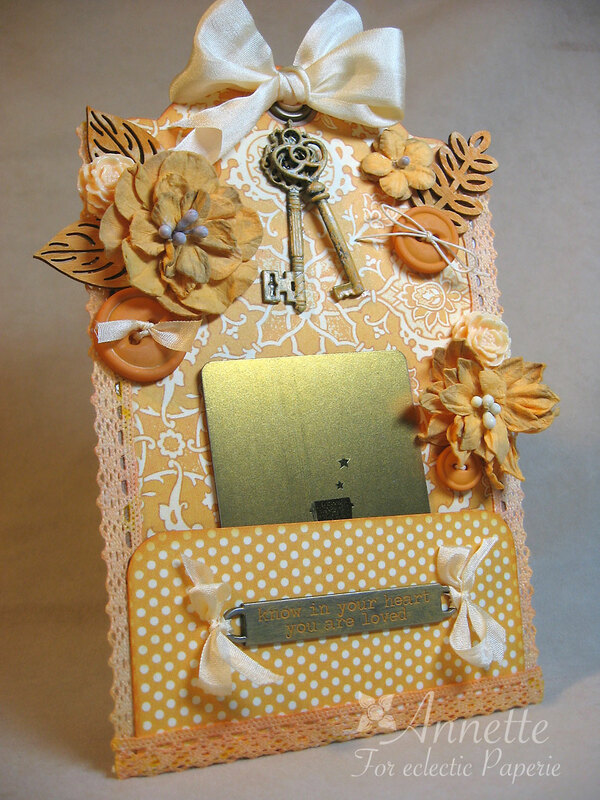 Beautiful make, Annette and a great challenge theme! Oh my Annette that is just beautiful..the papers are lush!! Working on mine right now. Awesome Annette, I love the colors and that neat looking tag!